Did I mention that I love AngularJS? Oh, yes I did, on my previous post. Well, in case you didn’t believe me, this time I would like to share yet another small solution with AngularJS. By the way, I forgot to mention that I also use the awesome Twitter Bootstrap CSS framework, along with the also awesome Font Awesome font icons. 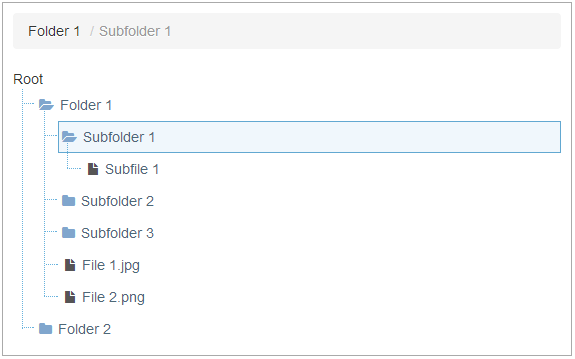 Where structure is the JSON model containing the folders and files, and options is the tree view configuration (optional). If you don’t provide any, the default configuration is used. foldersProperty String "folders" Name of the property that contains the folders array in your model. filesProperty String "files" Name of the property that contains the files array in your model. displayProperty String "name" Name of the property that contains the name to be display both for files and folders. collapsible Boolean true Whether or not the nodes are collapsible. If false, the nodes will always be expanded. onNodeSelect function (Object, Array) undefined A callback function that is executed whenever a folder/file is selected. The first argument passed to the function is the actual node from the model, and the second argument is a dynamically generated array of all the ancestor nodes. This is useful to display breadcrums for the selected path. The directive is recursive, so it should be able to handle any number of hierarchy levels (in theory). Source code in GitHub. Update (8/28/2014): Added option mapIcon, which expects a function that takes a file node as the argument and must return a custom icon class (String). Sample usage included. Yes, I’ve thought about it, Gilberto; either by specifying an icon “map” in the options or by supplying a function that would accept the node and return the appropriate icon class. Hi, Carlos. The source code along with a small sample are on Github. The link is provided at the end of the article. I’m glad you liked it. Happy coding! Sí, puedes encontrarme en LinkedIn. Can I integrate this code with angular js multiSelect..?? I am trying to incorporate that. I don’t know about that multiSelect. What are you trying to accomplish? But, in this example, in root there is nothing. And for folders everything works perfect. You are right. There was a subtle bug that prevented the directive from rendering the files on the first level. I just pushed a quick fix to Github. Thanks for finding this issue! You’re welcome, and thank you for quick solution! I found out your nice control. Do you have any demo page for this control? I saw your Index.html file. Please forget about previous question. Is there a way to return multiple fields from json? Right now I tried to feed this json and try to modified for own return value at onselect event. When I select, I want Id and type. How should I able to return it? The onNodeSelect callback function passes the model that corresponds to the selected node (folder or file). So whatever fields you included in the original model will be available in the callback function’s first argument. // You should have access to node.id, node.parent, node.type... etc. One more time to say, beautiful solution for this problem! But, nothing shows. And function ‘findResultTakenTime’ works fine. Is there something I am missing? And, If you know, can I rely on angular-moment functions from custom directive? You need to make sure you’re placing the function inside the correct scope. Other than that, I cannot possibly know what could be wrong without seeing the actual code.